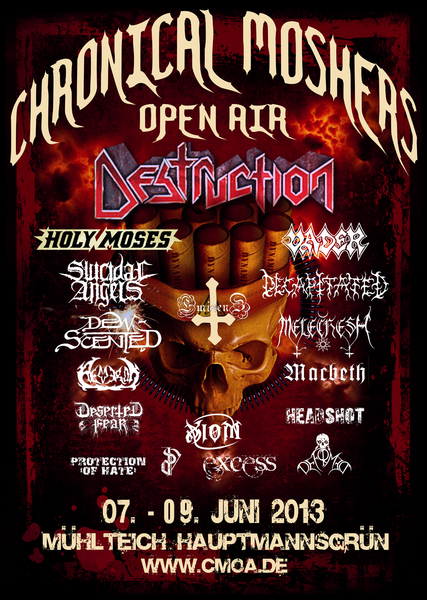 DEW-SCENTED - Relentless Thrash Metal from Germany - DEW-SCENTED » Festival Dates 2013 confirmed! DEW-SCENTED - Relentless Thrash Metal from Germany - DEW-SCENTED » Festival Dates 2013 confirmed! Home > NEWS	> Festival Dates 2013 confirmed! + Suidakra, The Very End, Synasthasia, etc. + Sodom, Loudblast, Destinity, Trepalium, Sublime Cadaveric Decomposition, etc. + Tankard, Hatesphere, The Sorrow, Suidakra, Motorjesus, Zodiac, Dawn Of Disease, Accuser, Contradiction, etc. + Obscenity, Aardvarks, Crosshead, etc. + Destruction, Vader, Holy Moses, Decapitated, Melechesh, Suicidal Angels, Eminenz, Deserted Fear, Headshot, etc. + Asphyx, Xandria, Milking The Goatmachine, Akrea, etc. + Tankard, Naglfar, Benighted, A.O.K., Hatesphere, Ektomorf, Soul Demise, etc. Confirmed for Wacken Open Air 2013; Working on new songs! Testament & Dew-Scented shows NOT happening!